Holiday Inn & Suites of McKinney, Texas provides great service and a business friendly environment to all visitors. Enjoy 24-hour staffed service that will cater to your every need. Our hotel is American owned and operated by Helm Hotels Group, a family owned company for over 30 years. UNMATCHED Customer Service and Experience. 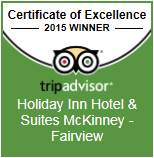 We are a top hotel in McKinney on Tripadvisor.com. M Restaurant is available each morning and evening to provide some of the best food in Collin County. Access to Chasers Lounge, our full bar and lounge between 4pm and 11pm each evening. FREE Access to 24-hr business center and fitness center. Ceiling Fans, Pillowtop Mattresses, Laptop Safes, Microwaves & Mini-refrigerators in each room. Preferred Availability and Pricing in Throckmorton Ballroom, our main meeting room capable of holding up to 200 guests as well as our cutting-edge Board Room. ©2017. Not an official site of IHG or one of its brands.